How do objects speak to us when we visit museums? Most of the time, an object's only voice is translated through a neatly-hung, factually-dense label. I have a lot of respect for well-written museum labels, but labels are not going to keep our institutions relevant in a changing world. Today’s audiences crave unique EXPERIENCES that have the ability to do much more than inform. Now more than ever, when we decide to leave the house, we want to be surprised, moved, enlightened, and even transformed. Text on giant colorful panels. Text on animated touch screens. An interactive here and there. I'm not saying that exhibit design can't be dynamic, but I do think we museum people are still too in love with disseminating information. This includes the “walking labels” in the form of guided tours. When I was a high school history teacher, there were always colleagues who blamed students for falling asleep in class. As the lecture droned on and students drooled on their desks, the teacher would snip, “It’s not my job to entertain you!” I hear similar refrains from some in the museum field. The implication: it’s beneath us to engage the public in an entertaining way. It’s not serious history, art, or science if we stoop to the level of the masses. But I couldn’t disagree more. The mixing of education and entertainment to create experiences is an art in itself. It’s a craft that I’ve been obsessed with since my days as a teacher. So allow me to attempt to convince you why creating experiences is so important. 1. In the 21st Century, information is everywhere. How historically accurate was the Hidden Figures movie? How much of our electricity is produced by wind power? You don’t have to wonder for long because that information is available literally in the palm of your hand. I don’t think that many museums have quite come to terms with the fact that the internet has fundamentally changed their purpose. People do a significant amount of self-educating these days. Our job should not be to disseminate information with “full coverage” but to provoke, question, and inspire people to learn more on their own. This requires a new set of tools and acceptance that what a museum is, is changing. Thinking of ourselves as businesses for a second, what is the “product” we are selling? If the answer is “information,” we’re in trouble. 2. 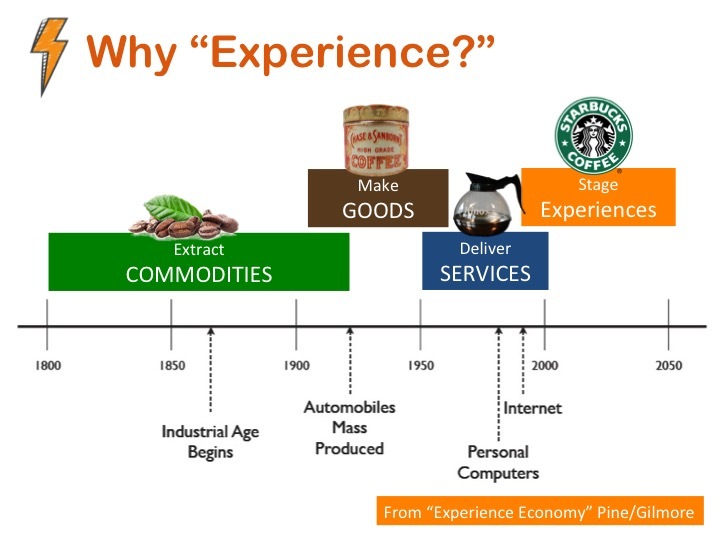 The Experience Economy is in full bloom. In 1999 Joseph Pine and James Gilmore coined the term “Experience Economy” and made a strong case for retail establishments to “stage” their businesses to create memories. Using historical trends in the last 200 or so years, they argue that the US and other developed countries have moved from an economy based on commodities in the colonial era, to one based on finished goods, then to services using those goods, and finally to an experience-based economy today. Their example in which coffee moves through these stages brings the concept to life. How does Starbucks get away with charging $3 for a cup of coffee? It’s the experience of hanging out in the funky cool atmosphere that justifies the price, not the coffee. As online shopping had just begun to take hold at the turn of the century, Pine and Gilmore urged retailers to ask themselves, “What would we do differently if we charged admission?” Fully embracing a theatre mindset, they said businesses should “stage” experiences – a revolutionary concept. At the time of the book’s publishing, a few retailers were already embracing the experience economy. Build-a-Bear Workshop (founded in 1997) writes this on the “About Us” page of their website. This excerpt underscores that the customer’s reason for going to Build-a-Bear is not just to purchase a stuffed animal. It’s clearly the experience. Since the 1990s more and more companies have caught on and the basic purpose of the retail store has changed. In fact, in 2017 if your business doesn’t provide an in-store experience it’s better to forgo bricks and mortar altogether. Just sell your widgets online, right? The seeds planted by the proliferation of internet accessibility and articulated by Pine and Gilmore are now in full bloom. The landscape they predicted has come to fruition. You might be thinking “Yeah, it seems like the for-profit world is just picking up on what museums have known all along.” But that leads me to my next point. 3. Museums’ competition with other leisure choices is now fiercer than ever. Museums are perfectly positioned for the Experience Economy. We have amazing artifacts and the mission-driven potential to stage experiences that have deeper meaning than any retailer or theme park. But I’d argue that, too often, visitors leave with a head full of disconnected facts and not enough “wow.” We need to step up our game, because businesses and other non-profits are now competing more than ever for our visitors’ precious leisure hours. A Blacklight Run is a 5k in which participants get doused with a different color glow powder for each milestone they reach. Cool Events LLC runs many similar events all over the country, with portions of proceeds going to cancer research. I happen to love glow-in-the-dark adventures. Check out this project I nicknamed "The Soil Rave." Third Man, which has retail stores in Nashville and Detroit, is not only selling records, they have embarked on a sort of preservation project - preservation of turntable culture. Record your own record album on wax for $20. Third Man Records: this ultra-modern record store that fosters appreciation for old technology among younger customers by giving them a chance to record their own record albums on real wax. If you want to get more serious, they offer recording time in a real recording studio in back. After spinning a few records of my choice, trying on a guitar, and falling in love with the unique retro/modern merchandise I went up to the counter. "What IS this place??" I asked the employee. She laughed and said a lot people ask that question. The store I visited in Detroit provided a stage where you can pose with a guitar and an employee will take a signature yellow and black Polaroid of you. (Yellow and Black are Jack White's fave colors). The fact that I wanted to commemorate my experience with a photo really tells you something about this hybrid kind of retail. Who is this middle-aged woman pretending to rock out with a White Stripes guitar? This was souvenir of my experience at Third Man Records in Detroit. Speaking of music, ever hear of Sofar Sounds? It's founders were motivated to create a more intimate and authentic concert experience where artists have the undivided attention of the audience, so they created a new model. A bit like Airbnb, "hosts" stage concerts in their homes or other venues (even the forest!) and guests "apply" to attend. You don't know where you are going or who you are going to see until information is released. What do you get for the ticket price? Connections with strangers, surprise, and adventure. These are elements any museum could adapt for their own purposes. Am I saying that museums should create more event programming? Maybe, if you want to put your eggs in that basket. Or not. But more than that, I'm talking about a perspective shift about the purpose of museums. Experience is not an add-on; it should be an everyday mindset. Maybe you're the type that likes to be convinced by the numbers? Museum Data Maven, Colleen Dilenschneider, gathered data that supports the idea of increasing competition for leisure time. Check out this sobering graph. In her post, “Why Those With Reported Interest Do Not Visit Cultural Organizations,” Dilenschneider explains that we are not only competing for visitors with sports events, concerts, and shopping, but increasingly with the couch in our own homes. There are just too many choices out there to take for granted that museums will continue to survive in their present from. If I had to guess why more museums aren’t taking experience design to the next level, it’s that they already think they are doing a great job in that department. "There's no where else on Earth where you can view this Roman chamber pot. THAT'S experience enough." Or that museums are in a different category than a trip to the water slide. I’m not exactly sure what the reasons are, but I’m interested in your opinion. 4. Millenials are the biggest consumers of experiences. A 2014 study by Eventbrite showed that three out of four millennials crave experiences over material goods. More than older groups, they are driven by “FOMO” (Fear of Missing Out). Although you may be tired of hearing about them, this age group is the key to the future of museum sustainability. The ability of a museum to stage experiences, either through live programming or immersive, participatory exhibit design is a key factor in attracting this audience. 5. Relevance is about more than connecting scholarly content to our lives – it’s about the methods of engagement. The way I see it, museums have two challenges when it comes to relevancy. First, they need to answer the “so what?” question when it comes to the content of every exhibition and program. Why should anyone care about your teacup collection or a little-known farmer’s historic house? (Thank you History Relevance Campaign for tackling this head on). But once you’ve figured that out, you’ve got to package that content in a way that engages today’s audiences. That’s where experience-based learning comes in. If you rise to the first challenge while ignoring the second, your museum can still end up in the “irrelevant” category. 6. Some of the best objects don't say "wow." Some objects are naturally awe-inspiring. Standing beneath the skeleton of a T-Rex is an experience all by itself. I was pretty darn excited to be standing in front of Lincoln’s real top hat. But what about those objects that aren’t famous or look a bit mundane? When I worked at the Atlanta History Center, our Civil War exhibit contained over 1,000 objects. One of them was a hardtack cracker. An item like this isn’t nearly as cool to an 8th grader as, say, a collection of giant cannon balls. But in the context of an experiential game, a 150-year-old cracker can take on a different, more memorable role. Based on a student’s choice in the above scenario (which was taken from a real soldier’s diary), various outcomes are revealed by the interpreters, and a student’s points are either gained or taken away. What would you choose? Want to find out what happens to you? Commit to a choice (WAIT or RAID), then CLICK HERE. 7. Experiences have the potential to be truly transformative. We museum people often cringe at the idea that we could learn something from Disney World or Las Vegas because these places seem to exude a tone that is not serious enough. But imagine if the Disney toolbox for engagement were used to unlock meaningful new understandings of the world and ourselves. Most learning isn’t like an on/off switch. With one decision you don’t realize, for example, that you value morality over pragmatism. Constructivist learning theory tells us that, experience by experience, we make meaning and learn how everything fits together - our version of everything. But it’s exponentially harder to focus on the important questions when we focus only on one-way delivery of facts. (“This is hardtack. It’s made of flour and water and was included in army rations. It was saved by Private X”). Last year I went on an independently guided tour of the Smithsonian National Gallery of Art. The guide explained the importance of dozens of paintings created in the Renaissance era. But what I came away with – what I learned about myself - was that I was too ignorant about Biblical scripture and art history to glean anything meaningful from the content of the tour. So that’s learning, but not the kind that was probably intended. Meaningful experiences can start with the base-level goal of involving people. Get people to participate - in a discussion, a game, a performance – and make it about ideas, not trivia. Add a little surprise, wonder, and compelling human narrative and you’re really making headway. "The Prophets With Isaiah and Ezekiel" by Duccio di Buoninsegna, 1308-1311. I still don't know why I should care about this painting. But here's the good news: with our foundations in rigorous scholarship and altruistic sense of purpose, museums are almost unstoppable if we can harness the power of experience. Ok, so the museum field as a whole needs to up it's game, but there are lots of stellar examples of innovative experiences in museums. For my next post, I’d like to highlight examples of museums, individual exhibits, or programs that are really killing it on the experience front. I have a few in mind already, but please send your ideas to andreajonesmail@gmail.com . Andrea Jones is a consultant specializing in helping museums to create transformative learning experiences. She conducts workshops and designs experiential programs for museums and cultural organizations.